See that top bay? That's a Viper bay. Don't need that.. Heavy fighter: 1. Heavy fighter (Gun heavy, default). 2. Heavy Missile Variant. 3. EMP attack, etc.. Bomber versions: 1. Bomber (heavy bombs, standard version) 2. all missiles. 3. use imagination. By different variants I simply mean different ordinance layouts of same ship. 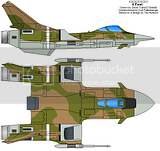 In no way are any variance versions needed or required, with your standard version I can make the variants, I just need the basic Heavy Fighter and Bomber. They must fit the bay door dimensions, and preferably look like a viper in its looks somewhat. Or resemble it is some way. Name your price... I'll tell you if I agree.. I'm thinking $20 USD each. Time limit on this offer is until I say screw it and make them myself.. can't see myself doing this in next month or so. But I can/will If I have too. I haven't checked to see if they're in the scale you want, but I have a couple varieties that might work. First is the Krait series. Next is the Tigerhawk. This aircraft has two modes; wings extended for the best possible atmospheric agility (subsonic), and wings retracted for the best possible atmospheric speed - both a moot point in space. There are two configurations; missile armed and gun armed. Finally, the Adder. This is a very large, heavy, fast, and long ranged striker. The crew is two in the front side by side, and two in the back, side by side, and most of the weapons are carried internally. I'll check them out for scale this weekend, that Krait series is pretty cool, and would be perfect if it were a bit bigger, but I may be able to figure something out. The Boomslang and Adder may work for the largest bay. Is the Boomslang for Space or atmosphere? The third bay doesn't necessarily need to be a bomber bay, it just seemed to make sense at the time to name it that. I figured some stuff out.. The Heavy Fighter Bay (Type II Bay) is 35.53 Ft x 25.84 feet. In other words, the Adder can fit in it (though very tightly) but then I can easily add another 6 inches to either side of the bay without having to change the main image as each pixel is 3.23 feet as there's no way to depict anything smaller then that, I can simply change the written dimensions of the bay by a foot and it wont change the image at all. The third bay (Type III) is 54.91ft x 38.76ft in size. Again with slight fidgeting as mentioned above, basically 55ft x 39ft.. Any ideas on something that size? I had to increase the Type III bay by two pixels (and had to update all type III bays on my ship, not fun) I went with Kurt's Roc. 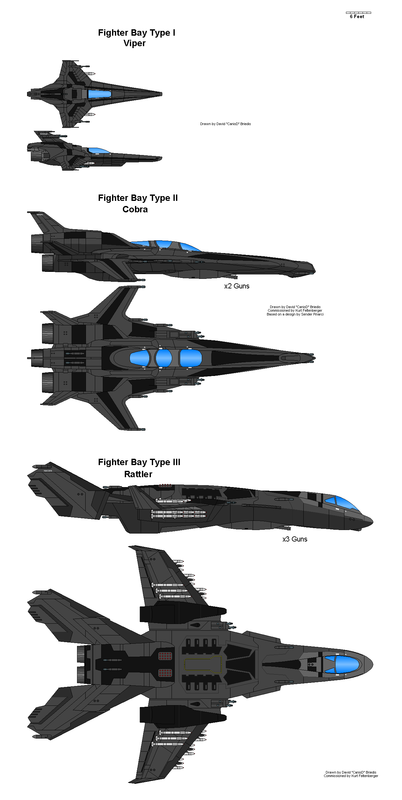 I'm modifying all the ships (Viper, Adder and Roc) to all be similar to one another, same paint job, all same/similar engines, layouts to reflect there roll etc.. I'll post them when I'm done. Kurt PM me your paypal as you found my Bay type II ship (Your Adder) so I owe you $20 as promised and thanks again man for always being so helpful!!! They all atmospheric capable as well as space capable. Don't worry about the $20, these were ones that Dave did for Lady H. If you really want to put the $20 towards this, donate it to VetRanch via the Abandoned Pet Project. http://www.abandonedpetproject.org/main_21/donate/ Dr. Matt and his fellow vets do amazing work with pets who've been abandoned and have injuries or illness so they can be saved from euthanasia and adopted into a loving home. 1. 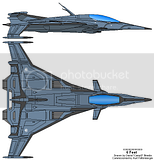 Viper, I changed the engine so all three ships match, added a missile under each wing. Changed window so all three ships match. 2. I renamed Adder to Cobra, if you look at the top view of second ship, imagine it nose down, it actually looks like a Cobra. I thought the under side of the Roc and that Gatling gun was awesome so added it to this ship, I just moved the ordinance door back. Also added two rear guns (as well as more in the front) as this has to be a heavy fighter, added a third window, its a single pilot seat for the two rear guns. 3. Renamed Roc to Rattler, due to the funky tail, also I thickened the rear of the ship near the tail as it seemed too thin for my tastes. I added a additional missile system to each wing and two more on top as well as added the cool side duel Gatling guns from the Cobra to this ship. I also added missile pods to top of ship. Added 4 rear facing guns to cover it's six and changed its engines to match the other ships. Added a ordinance door as this is primarily a bomber and wanted it to be obvious..
Kurt of course feel free to use whatever you like, Id be honored if you did use them. you have been so generous.